Turns out Android Pay is just the tip of the iceberg when it comes to Google’s plans for payments. At a Google I/O developer session, the company demonstrated Hands Free, a mobile commerce system that works sans wallet and smartphone. Still in the “early prototype stage,” according to Google ads and commerce exec Sridhar Ramaswamy, Hands Free seems fairly seamless. Tell the cashier or clerk behind the counter of a participating business that you “want to pay with Google,” and the cashier will see an image of your face and your name on the register. Then, the service works its magic, which is presumably a combination of geofencing and cloud-saved banking credentials, to verify your identity and the transaction behind the scenes. Once the transaction has gone through, you’ll have made your purchase without ever pulling out your wallet or phone. However, it’s not clear whether Google’s attempt at truly touchless payments will prove any more successful than the projects that’ve come before it. Square launched a similar effort, Wallet (which launched as Pay with Square) two years ago, but despite deals with big-name chains like Starbucks, low usage forced the company to shutter the service for good last May. This could potentially change how people do business! We’ll see! While McDonald’s has been attempting to refresh its burger offerings via things like mascot makeovers, given its recent business problems, McDonald’s is also working to attract new customers—those who wouldn’t normally eat there—to check out what else is on the menu besides a Big Mac. McDonald’s Canada decided to play a little branding trick on unsuspecting salad lovers by launching a pop-up shop called The Salad Society and giving away salads featuring ingredients like baby kale, feta cheese, and couscous. The idea was that a non-McD’s pop-up would take away any preconceived notions and instead focus on the quality of the food. But when the happy lunch crowd got to the bottom of their bowl, the jig was up. The brand has also partnered with bicycle delivery service Hurrier to give away four weeks of free salad deliveries, and created The Salad Society “membership” cards as branded gift cards. The announcement earlier this month that McDonald’s would be adding kale to its menu became a massive news story, prompting everything from mockery to debate over whether the brand could authentically incorporate an ingredient like kale into their menu. Salad Society is McDonald’s Canada’s way of side-stepping those conversations as it adapts to changes in consumer taste, and is one of the ways McDonald’s is attempting to stay relevant. Leveraging the authentic reactions of real people in advertising (The stunt was filmed for a spot that debuted on broadcast May 12. A longer, 50-second digital version of the ad is currently running as pre-roll on YouTube and other sites) provides credibility and could potentially convince those on the fence to try the item. Food trucks are everywhere in Austin. And now, there’s a new kid in town. 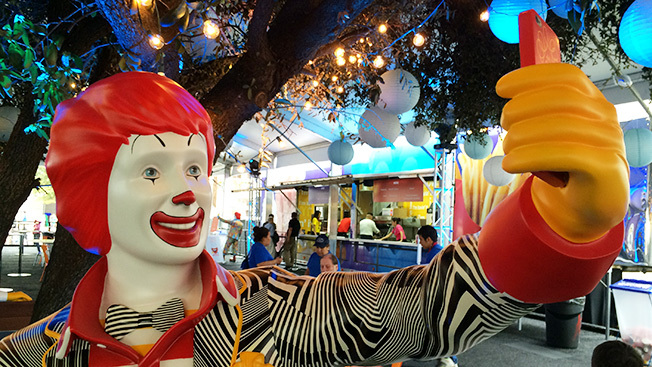 That new kid is McDonald’s, the fast-food juggernaut and 2015 South by Southwest sponsor. As if people couldn’t get any more cynical about South by becoming one giant playground for brands, the Golden Arches has settled right smack dab in the middle of it all with its own food truck—which is actually more of a food big rig, as this thing dwarfs any food truck you’ve ever seen. Proving everything is indeed bigger in Texas, the sizable footprint takes up the corner of 4th and Red River Streets in downtown Austin. For its official SXSW debut, McDonald’s will have Fri-Fi stations for mobile device charging, street performances, live music, plus a truck that serves breakfast and lunch meals. With St. Patrick’s Day around the corner, the food trucks will also be doling out festive Shamrock Shakes. In contrast to the casual atmosphere of a food truck, the brand will also host a private party on Saturday evening that promises Maple Bacon Bourbon Old Fashioned cocktails. McDonalds is trying to be seen as a brand that knows its audience, offering up “Fri-Fi” (Wifi), charging stations, and testing products that people may not be apt to try on a normal day…for free. Getting people to come back is an important thing for the brand to work on. We are all familiar with McDonald’s ‘Pay With Lovin’ campaign, having discussed it in Hot Sauce, prior to its SuperBowl debut. Now, independent brand monitors have shared results: an increase in WOM & purchase intent, w/little movement in favorability (sentiment was and is neutral). – WOM saw a five percentage-point bump, with 29% of adults 18 and over reporting that they had talked about McDonald’s with friends and family over the past two weeks, compared to 24% just prior to the campaign launch. – On game day, 36% of adults said they would consider making their next fast food purchase at McDonald’s; 11 days later, 39% said the same. One possible reason for the increase: people hoping to be chosen randomly for a free meal or watch others asked to perform a task, says YouGov. Why It’s Hot: You might say the campaign is gimmicky, but it is fresh and new and kind of sweet…and, it worked. A 20% lift in WOM and 8% lift in PI are major accomplishments, especially for a brand that has such a huge volume base. This isn’t just reinforcing the idea that brand marketing should “be good”, but should “do good” (in this case, asking people to hug each other)! McDonald’s pushes global harmony hard in its new brand campaign, which refreshes the long-running “I’m lovin’ it” tagline by putting more focus on the lovin’. The spot is called “Archenemies,” and features pop-culture foes suddenly finding peace. McDonald’s has never really leaned that hard into the idea of love— often focusing on the “I’m” and “it” parts of the line instead of the “lovin’ ” part. But the brand thinks the time is right for a shift. The brand feels like it’s on to something here. The refresh will include new uniforms, new packaging, new signage in restaurants and a new focus on being more responsive in social media—which is in line with the transparency campaign it’s been running lately. 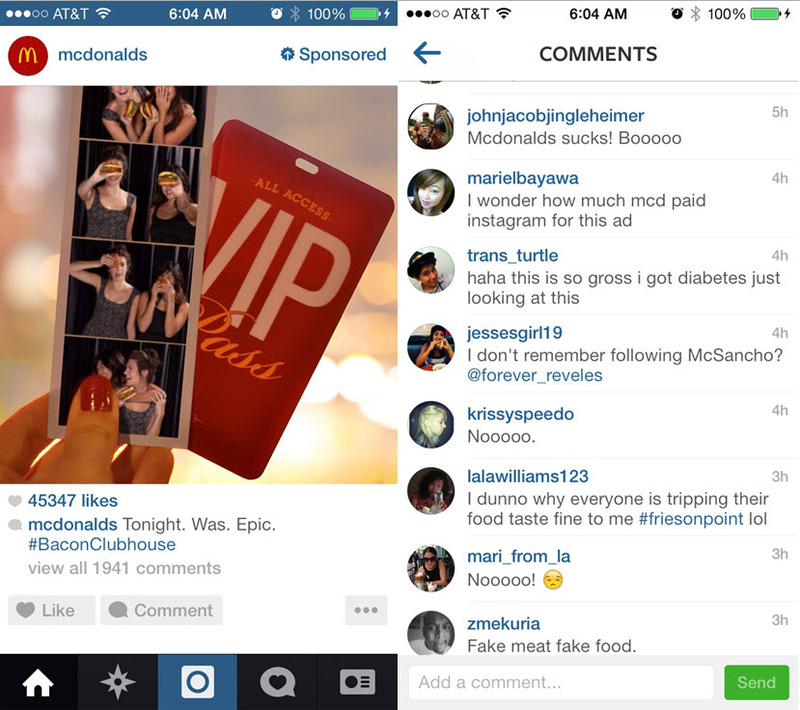 McDonald’s, a brand that still doesn’t allow fans to post on their Facebook timeline, is finally taking a step back and understanding the importance of transparency, authenticity and actually listening to what its consumers are saying. The fast-food chain is moving from a philosophy of billion-served to billion-heard, in order to evolve with customers. As the brand is experiencing a difficult time – declines in sales and facing a new type of more ecologically minded customer – can this brand transformation be its saving grace? It sounds like the brand has a few tricks up its sleeve, especially with a return to the Super Bowl with a 60-second commercial that “will reveal a big idea.” Only time will tell if the fast food chain can turn “lovin'” into sales. A group of fast-food enthusiasts are pinging the chain restaurant en masse to put a new pie on the menu. 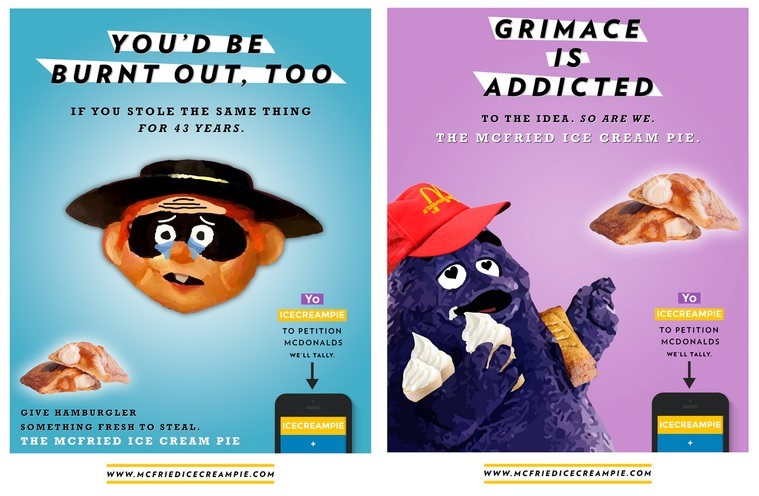 The McFried Ice Cream Pie Campaign has simple aims, and has chosen simple means for achieving them: in order to petition McDonald’s to combine two of its current dessert offerings, campaigners want supporters to use the effectively mono-functional app Yo to make their voices (or chirpy, pre-recorded simulacrum of them) heard. To garner interest in the Yo petition, the group has also put together a number of posters and a short video (below). The Fried Apple Pie and the Vanilla Cone are easily two of the most nostalgic items on the McDonald’s menu. Now imagine them together as one perfect, dreamy dessert. Can you taste it? No, you can’t. Not yet. We aim to change that. Let’s get the pie to the people. Stand with us and help unite these two favorites once and for all. To date, the relatively new and pseudo-popular app Yo has been through its paces in a handful of ways. Among other indicators of its mixed — if highly publicized — reception, Yo has already inspired two spoof apps. An app that seems to have relatively no purpose (one can argue that Snapchat, Twitter, Instagram and even Facebook at one point seemed to add no true value to our lives), Yo is finding its home among users in unique and thought-provoking ways. How do you get young people to care about recycling? Free burgers couldn’t hurt. The campaign makes a lot of sense for McDonald’s, since it not only aligns the often criticized brand with a cause, but also gets a younger crowd inside the store—an age group which the brand has struggled to appeal to (at least stateside). And once in the store, many customers could opt for fries or a drink to go with the burger, increasing sales of such items. See full article here. Restaurants are now realizing that they are “late to the technology revolution.” Recently food chains like McDonalds, Panera, Applebees, and Chilli’s Grill & Bar have been rushing to incorporate tablets, apps, and computerized kitchen equipment and data analysis capabilities. The aim is to speed up the overall process that a customer encounters at a restuarant like waiting for food or the check. Ronald M Shaich, chief executive of Panera Bread formed this idea a few years ago after reflecting on his daily life. Shaich highlights how every morning it was a routine for him to call ahead to the local Panera nearest his house to have his kids lunches ready to be picked up. He says “It sudenly occured to me that this was a wonderful system for the C.E.O., but what about the other eight million people who order from Panera?” (Strom, NYTimes) His end goal is for customers to have an overall better experience, because in turn it will benefit the business. Why it’s hot: It’s very interesting to see how technology can really make its way into any setting. Different types of technology are impacting the food service industry and this is only the beginning. 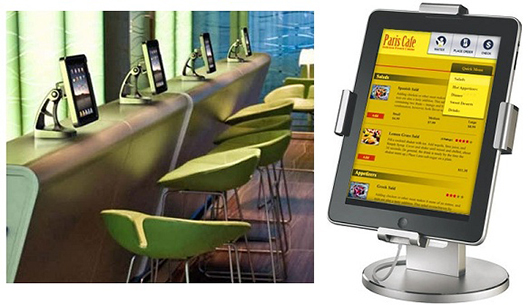 Will tablets eventually take the place of waiters completely? Chilli’s claims that tablets have helped one of their biggest complaints- slow service. 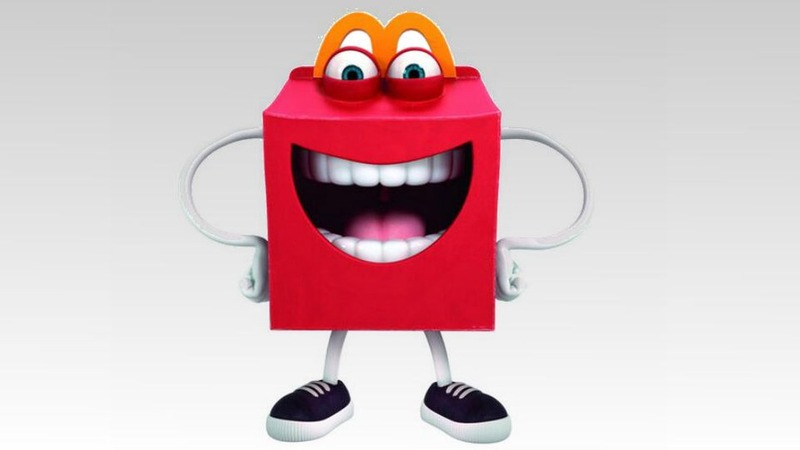 As if Ronald McDonald wasn’t scary enough, McDonald’s introduced it’s new mascot this past Monday and it’s nothing short of terrifying (see below). And although McDonald’s says “Happy” was created to bring “fun and excitement” to its children’s meals, social media thinks otherwise. We’re all aware how ridiculous the internet can be, and this week the people didn’t fail to bring the hilarity. From comments like “It’s the meal that eats you” and “I didn’t want to sleep tonight anyways, it’s cool,” it’s quite clear McDonald’s fell short in their approach. 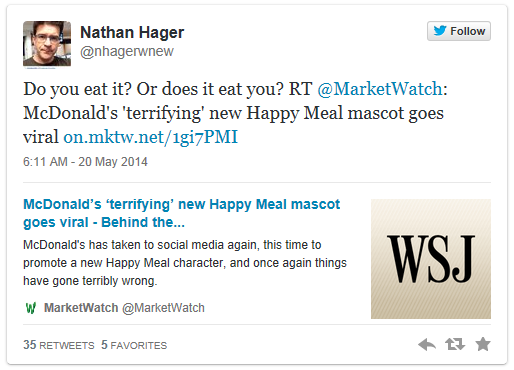 Only time will tell if Happy bids well with McDonald’s global customer base. For now, though, have at it internet! The World Cup is almost upon us, and official sponsor McDonald’s is launching a huge global effort that features new fry boxes that allow you to play and an augmented-reality app called McDonald’s Gol! Beginning May 26, the chain will — for the first time — change its medium and large fry boxes globally for the promotion, offering 12 different World-Cup-themed designs featuring work from artists commissioned from around the world. 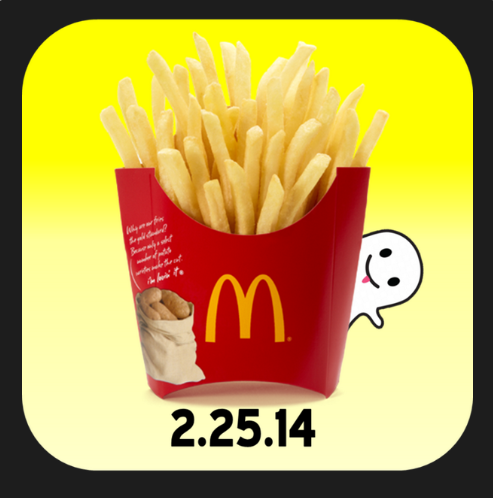 The fry boxes will also serve as the entry point for an augmented-reality game on the app. The app essentially turns the packaging into a virtual reality soccer field, where players try to flick a ball into the fry box, which serves as a goal. The game also uses other real-world objects in view as a way to bounce the ball off them to avoid increasingly difficult obstacles. Points are scored by bouncing off or moving the ball around the obstacles. Points are tallied by country, and players can share their scores via social media. Seeing one of the biggest and most recognizable brands embrace the World Cup by updating their packaging to include an interactive augmented reality game is VERY HOT. Especially knowing that this is the first time in McDonald’s history that they’ve changed their french fries packaging makes it even more special. As a consumer, I’m going to go to McDonald’s and try out this game on my own smartphone! As far as McDonald’s is concerned, this is exactly what they wanted. McDonald’s quietly joined Snapchat late last week and plans to publicly kick off the account on Tuesday with a snap from basketball star LeBron James, the company confirmed to Mashable. “We are excited to use Snapchat as a way to share the fun side of our brand with this highly engaged audience of millennials,” said Rick Wion, director of social media for McDonald’s.